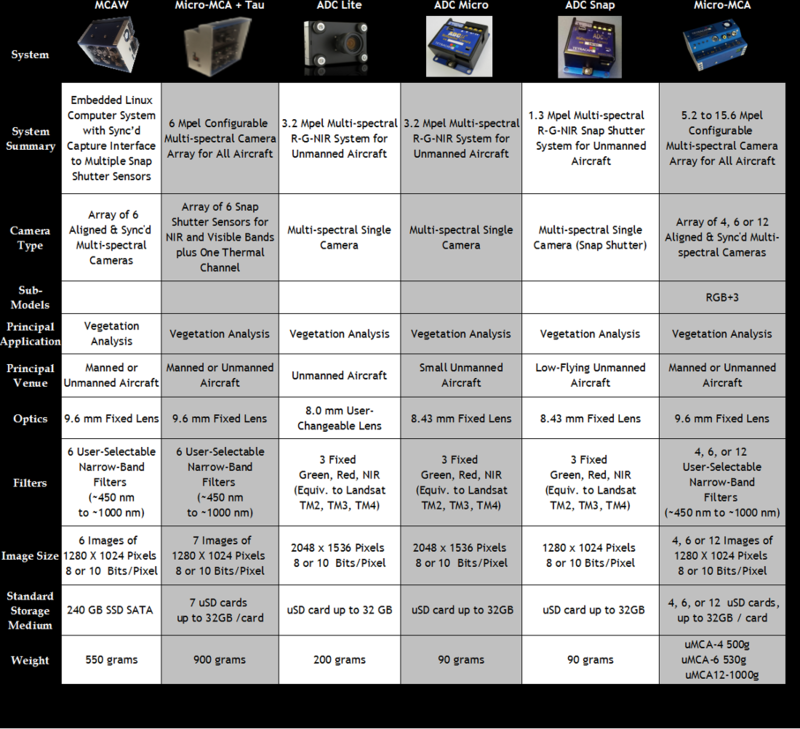 The Tetracam MCA camera series has been popular for researchers for many years. The combination of lightweight, replaceable filters, in addition to ruggedness have led to its being the most widely cited instrument in multi-spectral vegetation studies. 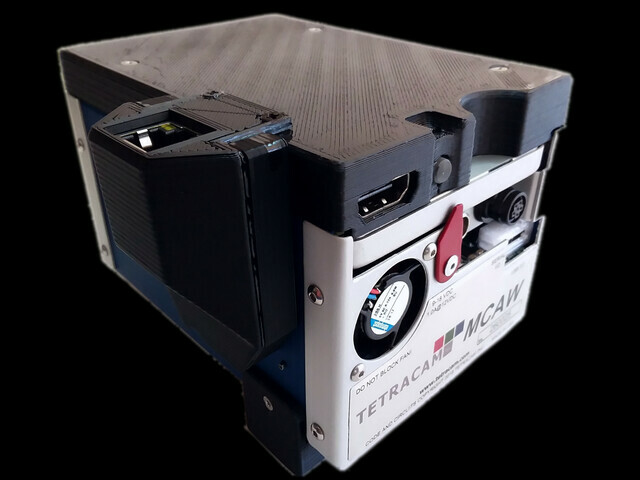 Over the years, Tetracam has introduced upgrades to the MCA electronics to keep performance competitive and provide new capabilities. 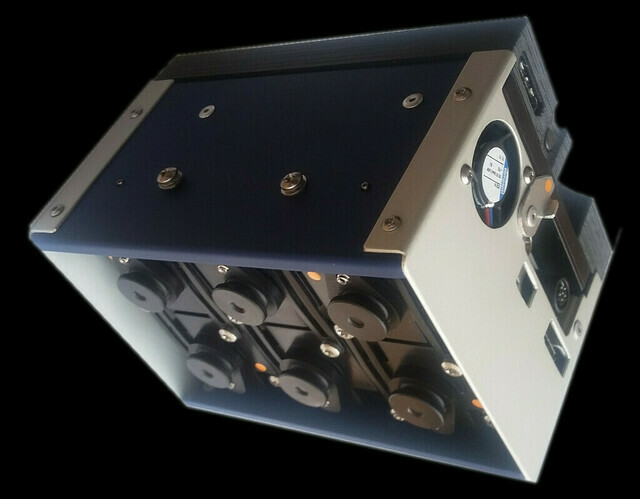 Accordingly, we are proud to introduce the latest variant of the MCA series: the Macaw (MCAW: Multiple Camera Array Wireless). The Macaw upgrades the MCA electronics to a full-featured Linux computer system, with open source architecture, and a SATA solid state drive (SSD) for computation intensive missions. While images are being taken, the Macaw can align image planes and extract vegetation indices, such as NDVI. It can do this at approximately the rate that the images are	acquired, thanks to its 2 GHz quad-core ARM CPU. The Macaw comes equipped with two interfaces: A serial port Linux console interface that provides a hardwired control interface, and a wireless LAN interface that provides services for a variety of clients used by developers: http, ssh, and ftp. The Macaw comes with development tools (Eclipse) already installed, and the source code for the camera application resides is in a development directory. A nearby PC, smartphone, or tablet can easily interface with the camera through the camera’s wi-fi hot spot. Using Xming and PuTTY clients with a PC presents a GUI for the camera. In the field, the Macaw can be controlled from a tablet or smartphone via any commercial web browser. A control tablet computer is included with the product. Using the browser interface, images can be viewed and downloaded, and help documentation can be easily accessed. For fast data transfers, the SATA SSD is configured with an external USB3 controller interface that transfers the disk to desktop PC or laptop for USB3 transfer speed. The browser interface can also be used to show a live video feed from any selected camera in the array. 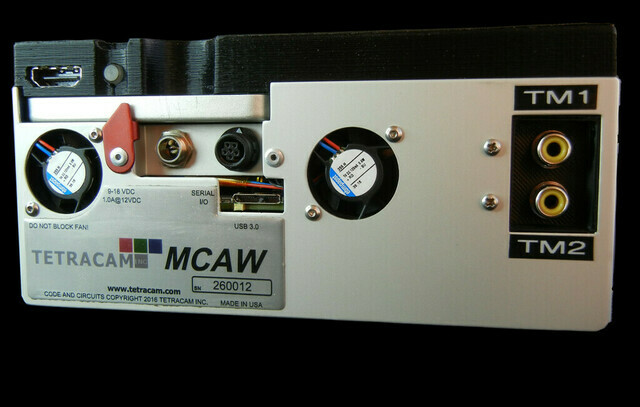 An external ILS module with a 1 meter cable is included with new Macaw purchases for increased accuracy of pictures taken. Like the Micro-MCA Snap, the Macaw comes with cameras equipped with lightning-quick global snap sensors, specifically designed for gathering distinct, stop-action imagery from unmanned aerial vehicles flying low and fast over forests or farmland. These sensors expose the entire image at the same instant in time. 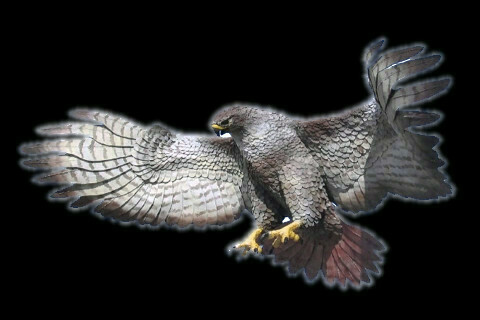 This allows images to be captured free of motion blur and other distortions. 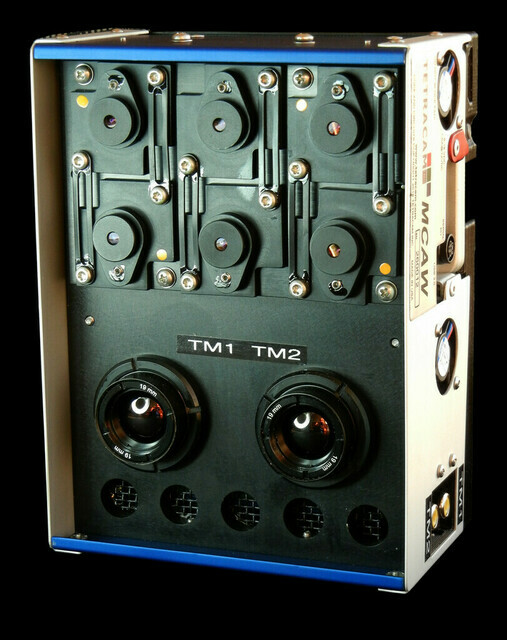 The Macaw is available as an array of six separate cameras. Each down-facing camera in the array is precisely synchronized with the other cameras so that each is able to capture the exact same scene at the exact same instant in time. Each camera is registered with the other cameras in the array with sub-pixel accuracy so all of the images are in perfect alignment. Each of the Macaw's cameras contain a customer-specified narrow-band filter that is inserted between the lens and sensor. With each exposure, six separate bands of visible or near-infrared radiation move through each lens and filter to form a separate monochromatic image on each sensor. The images are simultaneously transferred from each sensor to the Macaw's image storage directory in the solid state drive. 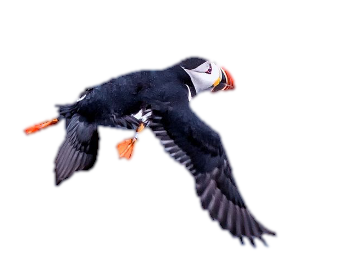 Processing of these images is done using the Macaw itself. A single multi-core processor replaces the 6 discrete processors in the older design, with an improvement in performance. Open system architecture allows users to configure their device in new ways. Files saved as multi-page tiffs, with alignment performed in camera. Files can be extracted at very high speed by switching the SATA drive to the USB3 disk bridge. 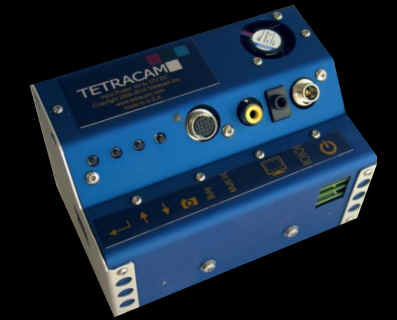 Traditional Tetracam operating modes are fully supported: continuous capture, triggered, various exposure modes, etc. Camera Application source files are available, on request, so the system can be customized in the field. 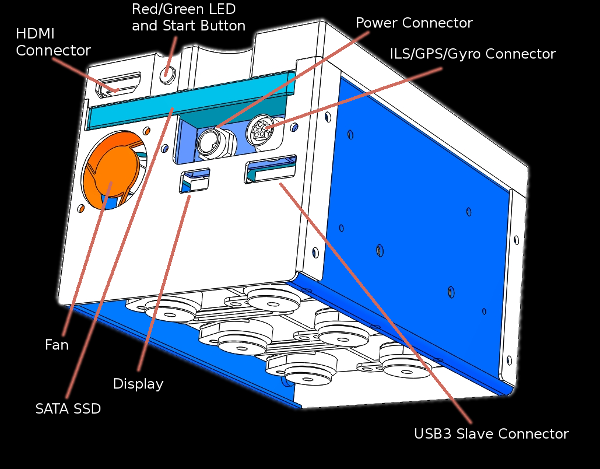 The MCAW has the same footprint as earlier MCA models, but the controls and connectors have all been grouped on one side of the camera, as shown in the illustration to the left. An HDMI connector is used to hook up to the flight system, and the ready/busy LED has been made part of the start/stop switch. 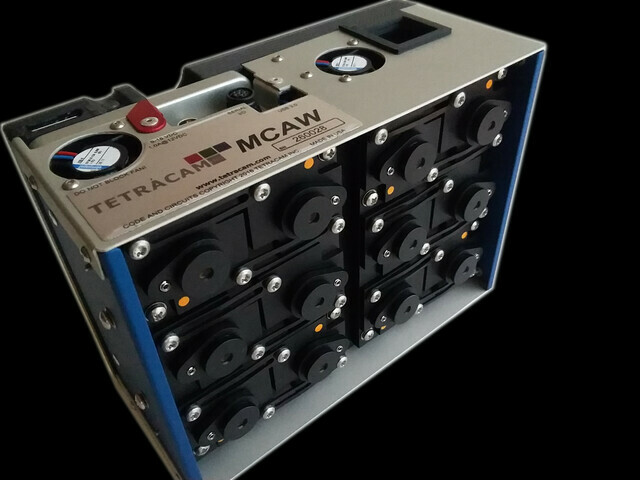 The MCAW electronics are available as an upgrade for mini-MCA and Micro-MCA Tetracam imaging systems currently in the field. It is supported by a multifunction ILS/GPS/Gyro accessory which provides metadata for the captured images. The new multifunction ILS unit can be mounted remotely with a 4 meter cable to ensure a good view of the sky. The cameras in the Macaw represent optical channels that gather multi-spectral information on a pixel-by-pixel basis for later processing by system software. Each camera consists of a lens, filter, and sensor. Users select the filters that they insert between the lens and the sensor in order to restrict the radiation that contacts the sensor to a narrow band of wavelengths. The combination of filters selected by the user enables the system to sense a unique spectral signature that identifies one or more plants, plant conditions or other compounds. Also, because Macaw filters may be replaced by users in the field, these systems may be re-purposed again and again to detect different wavelengths at different times for different purposes. The sensors in the Macaw are 1.3 mega-pixel CMOS sensors. These provide images made up of 1280 X 1024 pixels. Images may be configured via the system menu to sub-sample the image at smaller sizes (1024 x 768 or 640 x 512) in order to reduce the time interval required by the camera to capture successive images. The MCAW's global snap image sensor's output is optimized for receipt of wavelengths at approximately 650 nm. It has a high output response at 400 nm at the low end of the visible spectrum and provides good response into the near-infrared at the limits of its range. 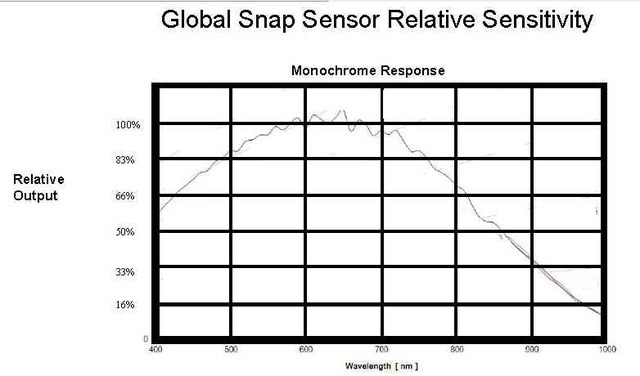 A graph of the sensitivity of the snap image sensor is shown below. By choosing a specific narrow band optical filter that is within the sensor's range to place in front of each channel's sensor, the radiation that is able to reach each sensor may be restricted to a specific narrow band of wavelengths. In this way, specific filter combinations may be selected that allow the MCAW to expose a variety of plant conditions identifiable by their unique spectral signature. For example, if the spectral response of various plants are known in the region of the spectrum monitored by the MCAW, filters may be selected that will help differentiate one species from another (see graphic below). This requires the user to know which filters to select in advance in order to expose the sought-after differences. 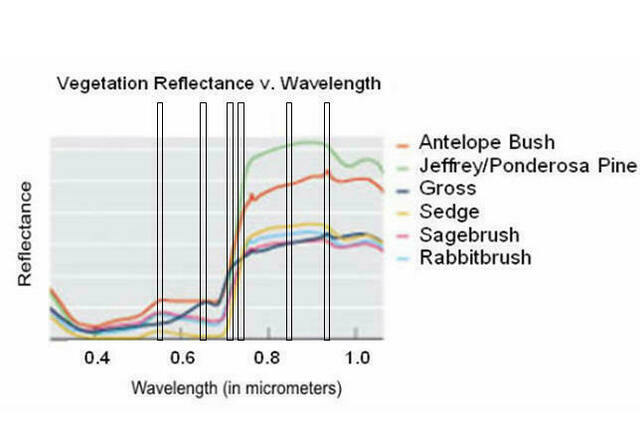 Note: For an excellent resource on spectral signatures of vegetation, reference "Hyperspectral Remote Sensing of Vegetation" by Dr. Prasad Thenkabail, et al. available from Tetracam. Other references may be found on our web site in our Multispectral Crop and Application Database. Alternatively, the Macaw may be set up to monitor specific bands of wavelengths from which vegetation indices may be extracted. These provide information needed for extraction of NDVI, SAVI and other indices as well as information that is able to be deduced from these. The band pass filters provided with the unit are customer designated at the time of order. These may be easily changed in the field in order to re-configure the system to look for different spectra to expose different conditions. Standard filters are included in the price of each system. Alternative special or custom band pass filters are available upon request with prices provided via a quotation. Additional information regarding band pass filter selection is available here. The Macaw can be entirely controlled via a web browser, which means a tablet, desktop, laptop, or smartphone can administrate the Macaw easily, as can be seen from the image to the left. Taking pictures, erasing pictures, setting the date and time, changing the values of the camera array alignment, and editing settings, for example, can all be done by clicking the buttons on the main page of the interface. Pictures taken can be reviewed and a live video feed is available. Individual pictures may also be downloaded. When reviewing pictures, individual bands can be selected to be shown from the multiple cameras in the array as well as various indices, such as NDVI. This is done without the need of transferring the pictures to another device. If the user is close enough to their Macaw while it is taking pictures, such as in a manned aircraft, they are able to review the pictures while the mission is taking place to be sure everything is going according to their unique plan. 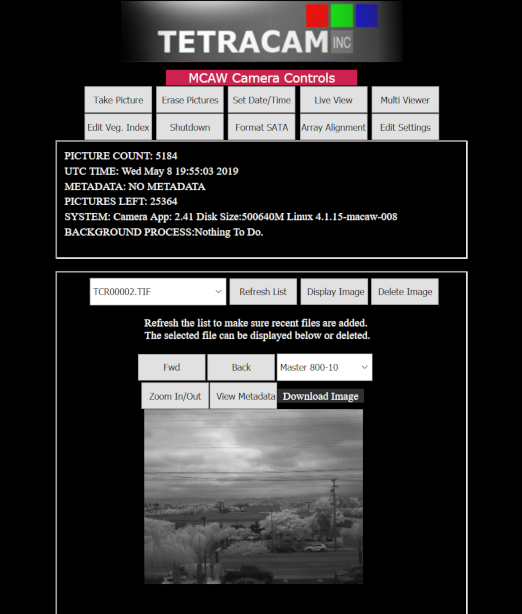 This page allows the user to select a live feed from any camera in the array. It also allows all the basic camera control functions to be performed, as does the basic status page. The ‘Review’ button takes the user back to the basic status page. There are several live view options available in the drop down menu. The options consist of individual views of each camera in the array as well as any indices defined in indices.txt. In the example, a traditional NIR, red, green view from indices.txt has been selected. A correctly configured index extraction in the indices.txt definition file can be streamed as a live view. The colors are determined by the palette selection, where applicable. The Macaw may be chosen to be optionally equipped with one or two thermal cameras. That means that the Macaw would have six narrow band cameras and one or two thermal cameras. Operating the Macaw with this option is the same, except thermal data is accessible via (a) page(s) in the multi-page TIFs the Macaw creates. Live view of the thermal sensor is also available. PixelWrench for Macaw can be used with the thermal data to extract accurate temperature values from a given scene. 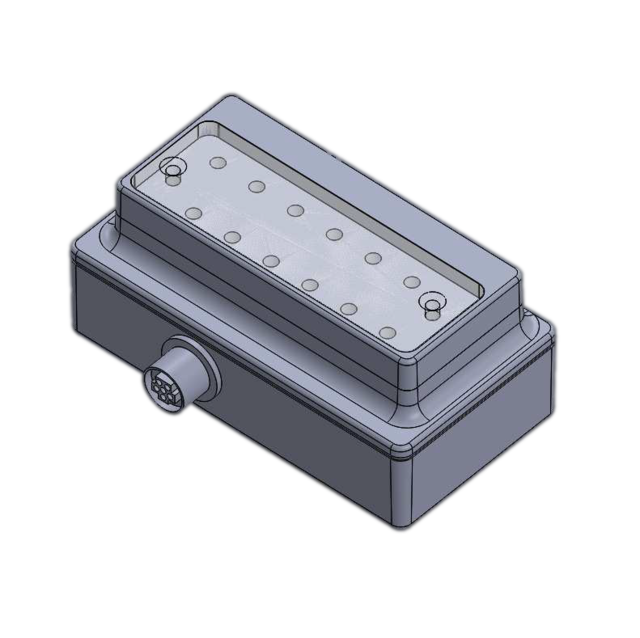 The thermal sensor is organized at 640 X 512 dimensions; it is upscaled to match the narrow band sensor dimensions of 1280 X 1024. Half size mode prevents the upscaling of the thermal sensor output. The thermal sensor is operated at 14 bit parallel mode; it is automatically scaled up to match the 16 bit data from the narrow band sensors. 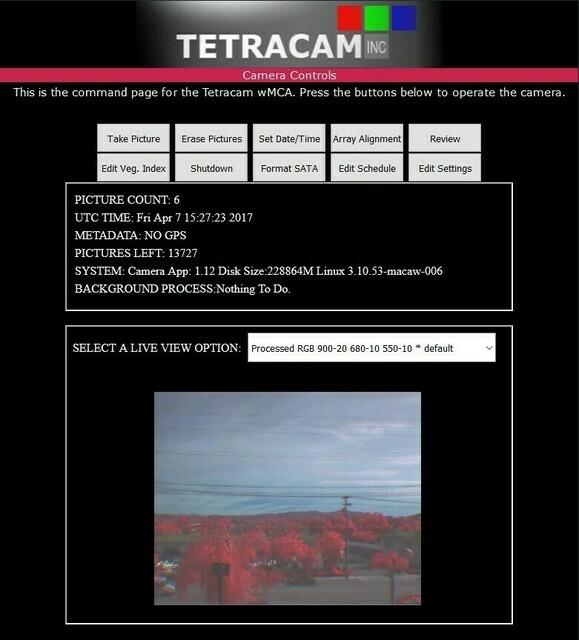 Live video of a thermal sensor can be viewed from the Live View screen in the Macaw web browser interface and through an RCA jack. The video feed using either method is based on the native thermal camera controller. The maximum capture rate when the thermal camera option is enabled is about one frame per second. The thermal camera can be disabled by removing the thermal entries from the bandinfo.txt file. When the thermal camera is disabled, the Macaw can capture at about two frames per second. Absolute temperature values for each pixel can be found by using the Macaw captured data with PixelWrench for Macaw. Temperatures calculated are accurate at about +/- 10%. Thermal data may be combined with narrow band data in the camera to produce false color RGB images according the entries in the indices.txt file. PixelWrench for Macaw can also create false color RGB images by specifying the thermal band as one of the band choices. 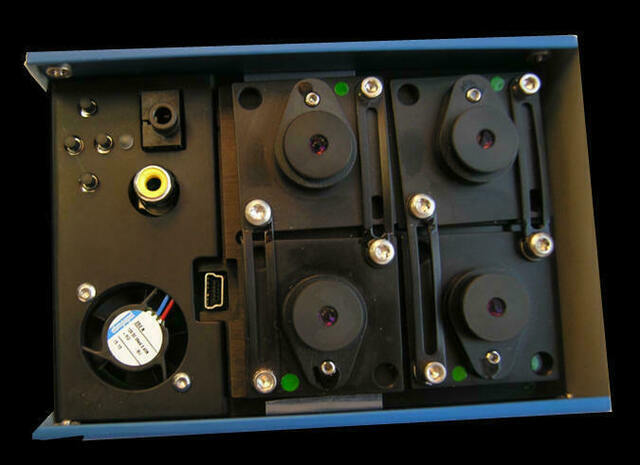 The thermal camera option in the Macaw adds about 250 mA at 12 volts (3 watts) for each thermal camera in the system. The Macaw may be chosen to be optionally equipped with Ethernet capability. That means that the user may interface with the Macaw using Ethernet or Wi-Fi, even both simultaneously. The user may experience the stability of an Ethernet connection whenever it is desired, as long as they connect to the Macaw's unique Ethernet IP address. Ethernet may be configured for DHCP or Peer-to-Peer (P2P), depending on what is most convenient for the user. Ethernet ensures that the user is always connected to the Macaw; after the Macaw powers up, the host PC is able to access the web browser interface immediately. Through the web browser or Samba, image download speeds of up to 35 MB per second are achievable. Experience fewer interruptions in live view mode when utilizing the Ethernet connection. 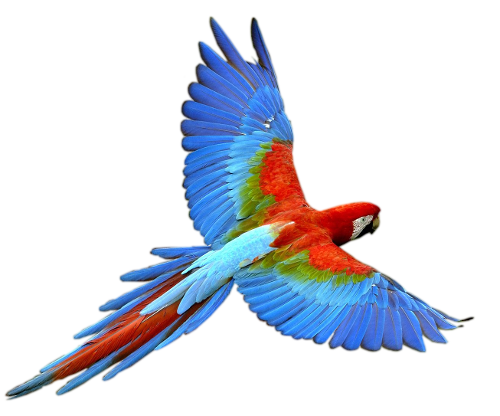 Ethernet is a stable connection to the Macaw without the distance limitations that come with using exclusively Wi-Fi. The Macaw may be chosen to be optionally equipped with 12 channels. This is equivalent to the 6 channel configuration, except 12 sensors are used. Images are saved as 12 page multi-page TIFs, each at approximately 30 MB. Live view is available for all 12 bands in the array; also, all 12 bands can be viewed at once using the Multi-View function. Instead of 12 separate processors like what was the case in the Micro-MCA12, there is one quad core processor that controls all 12 sensors, which is much more reliable. Instead of 12 micro SD cards like what was the case in the Micro-MCA12, all 12 bands are saved in multi-page TIF format on the Macaw solid state drive, no post-processing required.